Lovina beach is one of the most popular touristic destinations in the North of Bali. It is about 10 km to the west of Singaraja. The location of Lovina Beach is in Kalibukbuk Village, Buleleng regency, Bali. Lovina Beach is attractive because it is the only beach in the north of Bali where you can do a unique activity which is dolphin spotting in the middle of the sea while enjoying a beautiful sunrise. Lovina has a black sand beach, and the location is still natural. On this beach, there are hundreds of dolphins probably even more. 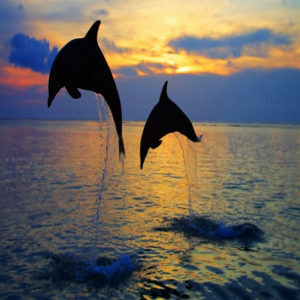 To be able to see the dolphins in action, you must go to the sea before sunrise. Dolphins will appear in the middle of the sea between the hours of 6 to 8 am. The journey to the middle of the sea in Lovina is very interesting. Lovina is relatively quiet, so it can be passed comfortably by using fishing boats. You may find the dolphins about 1 km from the shore. Some dolphins are jumping out of the surface, and some dolphins are just swimming. That’s really an interesting attraction. The Dolphins act very friendly around humans, they give a good impression for the tourist or visitors. All visitors will be presented with the style and the funny behavior of dolphins directly in the middle of the sea. 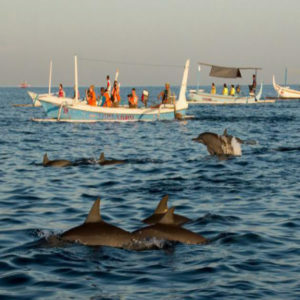 Lovina area is inhabited by hundreds of dolphins that are always ready to comfort the tourists who come and see the funny actions, adorable and fantastic dolphins. 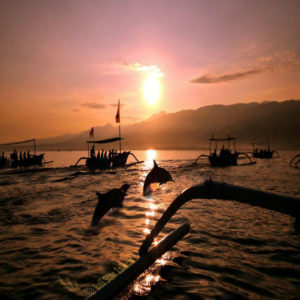 In addition to witnessing the attractions of Dolphins directly, Lovina Beach also presents an amazing underwater beauty. Tourists can enjoy it by snorkeling. In the sea you can find a various species of ornamental fish are friendly to visitors who greeted. In addition to ornamental fish, there are also coral reefs as well as various typical underwater plants that are guaranteed to satisfy the tourists. Even on the beach, tourists will find various shells of diversity and color. If you want, you can take it for free as a natural gift. How to access Lovina Beach? Lovina Beach area is located on the north coast of Bali Island or about 10 km west of Singaraja. This beach can be accessed from Denpasar by Bedugul then to Singaraja and finally headed to Lovina. The travel duration is usually only 3 hours. However, during the trip tourists will be presented by various panoramic natural beauty which is interesting, beautiful, and one of a kind.